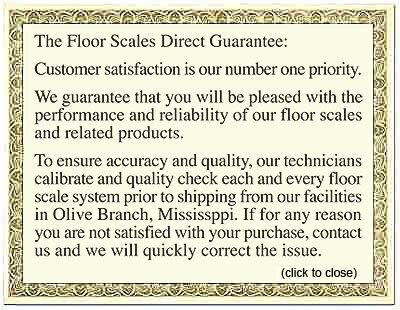 When you have heavy shipments to weigh, FloorScalesDirect.com offers floor scales for sale that can handle the extreme weight demands of your operation. 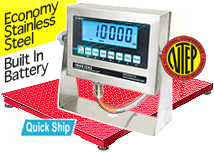 We carry the 10,000 lb industrial floor scales you need to get your business moving. 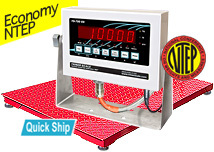 Our industrial weighing scale packages include a weighing deck, advanced functionality digital indicator, and the cables required for quick and easy set-up. 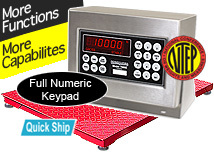 Our packages are outdoor rated and are calibrated at the factory for the highest accuracy. Our 10,000 lb industrial floor scales are perfect for shipping and receiving warehouse items including containers, drums, pallets, and skids. Enjoy our “Quick Ship” option which puts your order on the fast track to delivery by the next business day. We also offer free shipping on orders across much of the U.S.A. 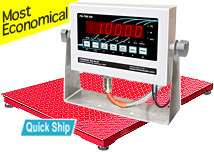 So if you’re looking for floor scales for sale, browse our industrial weighing scale packages from FloorScalesDirect.com, and find the 10,000 lb floor scale to fulfill your weighing needs.